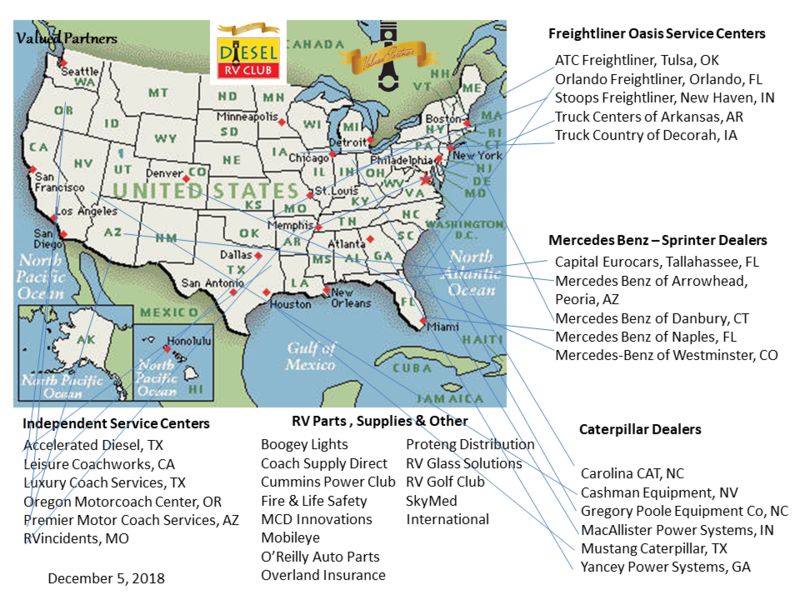 Valued Partners and all have agreed to offer discounts (ranging from 5% to 10% off on parts and/or services) to Diesel RV Club members. To qualify for your discount, identify yourself as a club member and present your membership card evidencing your active membership at the time of purchase. This list is updated as of August 23, 2017. Check back often as this list continues to grow. Effective May 6, 2013 – ATC Freightliner of Tulsa, Oklahoma, a Freightliner Oasis Dealer, is offering a 10% discount on parts and service. To receive this discount you must show your current Diesel RV Club Membership Card and let them know you want to take advantage of the 10% discount. Effective March 20, 2016, Boogey Lights is offering a 10% discount on its high intensity LED lighting specifically designed for RVs, Motorhomes & Trailers purchased online at its website or by phone 800.847.1359. Carolina CAT will be offering a 10% discount on parts and service up to a limit of $250. To receive this discount please show your current Diesel RV Club membership card at any of their five truck service locations. Luxury Coach Service is a convenient one stop shop for all preventative RV repair and maintenance services on motor coaches from class C to luxury class A. Our certified technicians, a 40 bay service facility and a spacious parts department ensure your expectations will be met in a professional and timely fashion. LCS offers a 15% discount on all parts and labor. MCD Innovations, the world’s largest manufacturer of roller shades for RVs, is offering members a 10% discount on shade purchases. MCD offers a full selection of the American Duo and GOLD Series Day/Night Shades for your coach windows. The shades are Made in the USA and are available in power or manual operations. Members must show their membership card evidencing current membership at time of purchase. Call 800-804-1757 or email info@mcdinnovations.com for details on their extensive line of window shades and more. Location: 3303 N. McDonald St., McKinney, TX 75071. Effective May 29, 2013 – Mercedes-Benz of Arrowhead, Peoria, Arizona, a Mercedes-Benz Sprinter Dealer, is offering a 10% discount on parts and service. This offer includes all makes and models build on Sprinter chassis. To receive this discount you must show your current Diesel RV Club Membership Card and let them know you want to take advantage of the 10% discount. Effective July 29, 2013 – Mercedes-Benz of Naples, Naples, Florida, a Mercedes-Benz Sprinter Dealer, is offering a 10% discount on parts and service. This offer includes all makes and models build on Sprinter chassis. Show your current Diesel RV Club Membership Card and let them know you want to take advantage of the 10% discount. Mercedes-Benz of Westminster, Westminster, CO offers a 10% discount on parts and labor for all makes and models build on Sprinter chassis. To receive this discount you must show your current Diesel RV Club Membership Card and let them know you want to take advantage of the 10% parts and/or service discount. FMCA is a Consumer Association member of the Michelin Advantage Program. This program is intended to provide competitive prices on RV tires at all authorized Michelin RV tire dealers that handle national Discounts. Members should visit www.michelinrvtires.com to locate an authorized Michelin RV tire dealer, to research tires, and to select the right tires for your motorhome. The tires listed on that site are included in the program and they include tires for light trucks and passenger vehicles. Uniroyal and BF Goodrich tires also are available under the program. All locations can handle repairs. The Truck Center is better equipped for RVs. Oregon Motor coach Center is a Certified Service Center in the Pacific North-West, which has served the Eugene and surrounding areas for a decade. Established in 2008, specializing in RV restorations, renovation, custom van conversions, repairs and maintenance. OMC is offering a 10% discount on parts to current Diesel RV Club Members. O'Reilly Auto Parts stores, an auto parts store with over 3,700 stores nationwide. is offering it's discount program for Back Counter Parts, such as thermostats, alternators, batteries, etc., and the discount will depend on what you buy. It will also be based on how much all members use the program -- the more we use it over time the greater discount in future years. Remember, the discount does not apply on items in front of the counter. Also, you may want to check any current sales flyer as the discount will not apply to items already discounted. For program details go to the O'Reilly Auto Parts page. Effective June 15, 2013 –Premier Motor Coach Services, is offering a 10% discount on parts and service. Please note the new location conveniently located at I-10 & Exit 264 (Palo Verde). They're on the south side of the freeway next to McDonald's. You must show your current Diesel RV Club Membership Card in order to take advantage of the 10% discount. Effective July 31, 2018, Proteng Distribution is offering a 10% discount on revolutionary fire suppression parts that protect motorhome systems and passengers from unnecessary harm due to fire and from the systems in place that were supposed to protect them. Proteng devices are designed to protect machinery, engines, computer systems, electronic equipment, and other high-value assets. They require no maintenance and function automatically. https://proteng.com/ 561-777-8364. RV Glass Solutions has over 2,500 locations in the United States and Canada. Ask about Foggy Side Window Repair/Replacement. RV Golf Club offers a 20% discount on its RV Golf Club memberships entitling its members free parking at golf courses and RV Resorts all over North America. To obtain the discount you must use the link embedded in the above logo or this one here: www.RVGolfClub.com. An RV Golf Club membership opens the doors to FREE OVERNIGHT RV DRY-CAMPING PARKING at hundreds of GOLF COURSES and GOLF HOTEL RESORTS throughout the United States and Canada and you do NOT have to be a golfer to join the club. Class "A", "B" and "C" RV's; 5th Wheels, trailers and truck campers are welcome. You do NOT have to be a golfer to enjoy all the benefits. This is all about being an invited guest to park in stunning places at no cost. Locations: Hundreds of golf courses and RV Resorts all over North America. RVinciDENTS, a RV repair, body and paint specialty company, is offering a 10% discount on parts and services to active members. RVincidents provides high quality repairs (including full-body painting and interior restoration) on motor homes, travel trailers, fifth wheels, tent trailers, truck campers, van conversions, utility trailers, shuttle buses, horse trailers and bus conversions. Members must show current membership card. Effective September 10, 2013 - Yancey CAT, the Nation's Oldest Caterpillar Dealer, is offering a 10% discount on parts and service. You must show your current membership card to take advantage of the 10% discount. 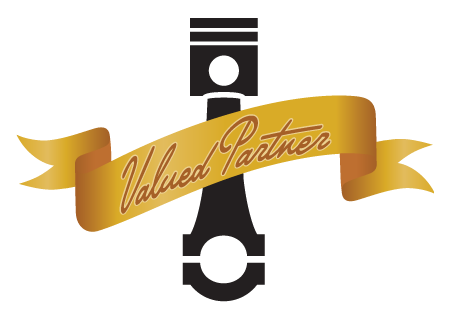 Want to Refer Your Local Dealer / Service Center to become a Valued Partner?